The Eastern rock lobster (ERL) Sagmariasus verreauxi has potential for aquaculture and recent success in hatchery production means juveniles can be reliably produced at IMAS. This provides good quality animals for research of benefit to developing aquaculture and further understanding wild fisheries. Optimising feed lipid composition is an important research objective due to the escalating cost and unpredictable supply of marine fish oils. This experiment aimed to investigate the effect of dietary lipid class and fatty acid composition on juvenile ERL lipid utilisation and lipid metabolism gene expression. A juvenile lobster reference feed was used to compare three different oil sources added at 15% wet weight: a blended marine fish oil (MO); krill oil (KO); a blended vegetable oil (VO). Juvenile lobsters (mean wet weight ± SD, 176 g ± 36, n=18) were stocked individually on the first day after moulting and fed one of the three feeds twice per day to satiation for 8 weeks. All individuals were approximately the same age (same moult cycle) and were sampled during late intermoult between day 55 and 60. Apparent digestibility was measured during the experiment. At the end of the experiment the lobsters were euthanized, the whole hepatopancreas and tail muscle dissected out, weighed and samples removed for analysis of lipid composition and gene expression. Diet influenced apparent digestibility (AD) but not growth, digestive gland index or tissue total lipid. AD-total lipid was lowest for KO, partly due to the low AD-phospholipid. AD-triacyleglyceride was over 97% but lower for MO than for KO and VO. Diet influenced tissue fatty acid composition: EPA, DHA and ARA were highest for MO; LNA and LA were highest for VO. Although total lipid increased in both tissues and was not influenced by diet, both tissues had lower DHA, particularly the hepatopancreas of animals fed VO. Expression of fatty acid desaturase and fatty acid synthase genes were significantly higher for VO and KO than for MO. Differences in fatty acid profile, distribution of fatty acids amongst lipid class and differences in digestibility of lipid classes appeared to reduce the availability of n-3 long-chain polyunsaturated fatty acids (LC-PUFA) from krill and vegetable oil. 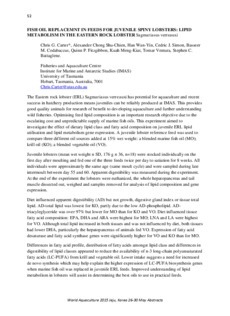 Lower intake suggests a need for increased de novo synthesis which may help explain the higher expression of LC-PUFA biosynthesis genes when marine fish oil was replaced in juvenile ERL feeds. Improved understanding of lipid metabolism in lobsters will assist in determining the best oils to use in practical feeds.